I have a 15 year old 2 panel solar thermal system which is no longer functional (the wet circuit leaks), after 3 DIY attempts to fix it, (only 2 successful) I would now need to replace the whole wet circulation system and controller and other expensive bits. just not worth it. so I am turning my mind seriously to PV. I have a decent roof area to play with. Based on some initial quotes I've had already, my main roof (SE, 145 degrees) will fit around 21 panels, a SW roof (with an awkward hip) perhaps another 3, and my extension roof (1 storey , but same SE orientation) another 6 or so, and . I can afford to max it out - the capital to fund it sits in an offset mortgage savings account on which I pay BOE+2%. 8 Kw peak is quite do-able I think. I have a PHEV, which gets charged with 10KwH every day in the early evening after returning from commute, and then another 2 or 3KwH in the late evening (as it gets used for evening family activities mid evening, its worth doing the early evening charge). E7 charging of a PHEV isn't worth it because (a) the day rates are so high (b) we need to charge early evening so we can still use it on electric mid evening. Our annual usage (comprehensively graphed with your-loop) is around 9500kwH, a typical day is around 25-27kwH including the car. I am on Foxthemarket very high user paying 10.5p/kwH (but with a whopping standing charge). I'm keen to put in a system that will allow me to timeshift daytime PV into the car in the evening, and to partially run the house. Also that will allow me to charge the battery on E7 (as moving to E7, or one of the other flexi tariffs, may well make sense once I have a PV system) - if it could look at the next-days weather to decide how much to charge by, that'd be a bonus!. In the future, I will change to a long range BEV when affordable (i.e. not a Tesla), at which point PV to car with a Zappi becomes an option as there will be at least some days where such a car was at home in the day with some room in its battery. I'm a total newbie on PV component selection but being a geek, I want to know exactly what I am getting and why, so after some reading I'm making my first post. I'm kind of relaxed about the panel look, so long as they are good output for the money and decent warranty. The only complication is that 4 triangles plus 3 rectangles would make better use of my small SW roof, but the SE large ones can just be filled with rectangles. I've asked installers that I've spoken to about triangulars and they seem to be very wary / denying their existence, whereas a simple google would appear to tell me that they do..
Inverters and batteries - one installer has suggested a single hybrid inverter for the whole thing (with the panels), either Solis+pylontech, or solaredge+LG, which makes sense to save money on a second inverter for the battery, BUT it would seem to require the batteries to be in the loft as they need to be DC connected to the same inverter as the panels. Which doesn't make sense to me - 100's of kg of big batteries in my loft with high temps, doesn't seem sensible from a physical install or battery longevity point of view. I have two good possible ground floor locations for the batteries, which would require them to be AC fed as nowhere near the roof. The solis+pylon appear good value, at least from the online supplier thinkrenewables -there appears to be quite a lot of markup on quotes with install. 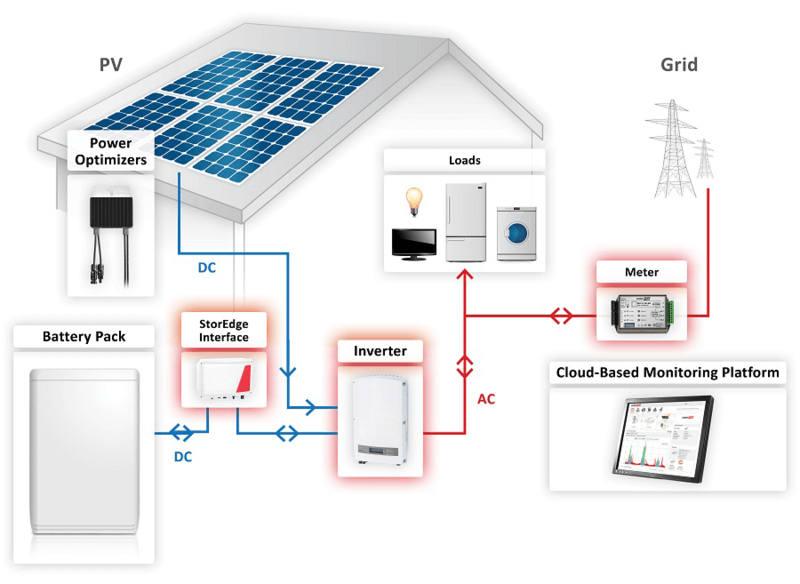 I'm pretty baffled about the many PV inverter options. About 10% of my main SE roof will get some morning shade from a neighbours tree to the north east, the extension SE roof a little more. and the SW roof will get some shade from a chimney. As I'll have a lot of panels, I'm keen to know that they are all working nicely and be able to do something about it if not. So I sort of favour the power optimising idea, but I am hearing varying different opinions. I'm also wonder if, as we don't know how much DNO will be approved, its necessary to have a system that's capable of limiting the export (whilst still keeping the generated power for house / battery use). lastly, if anyone can recommend an installer in the milton keynes area. thoughts appreciated, thanks in advance. You say that the batteries would need to be AC fed if not in the loft, presumably because the installers are planning on puting the inverters in the loft. With my installation there is a DC cable running from the loft to the basement and the inverter is in the basement where it is cooler and easier to access. Is there a major problem with you putting the inverters in a ground floor location - there may be some significant redecorating needed - mine was put in before we replastered! my assumption, based on an engineering degree, was that the principle that systems designers would work to would be to keep the DC transmission as short as possible . And thus the general rule with installs would be that inverter would be sited as close to the panels as possible (i.e. in loft). And so the long run through the house from the inverter to consumer unit then being done as AC. Is this not the case? Is is common to put the inverter near consumer unit (which is generally speaking, downstairs somewhere) and have a long DC run ? Either way would work, however larger DC cable sizes might need to be used to mitigate volt drop. Most installers just use standard size cable and don't think outside the standard box. Your inverter could be downstairs, providing the DC cables from the panels to the inverter were run iaw the regs and were increased in size to reduce the voltage drop. Possibly having a DC isolater both in the loft and downstairs. DC side can be a higher voltage/lower current than the mains side, so in some respects it is more efficient to have longer DC cables than AC. Also the DC side in many cases has a cable of greater CSA, again reducing losses. Just need a few calculations to verify cable size / volt drop. My friend just had panels fitted (3.9 kw) and the installer ran the 15 m AC supply in 2.5 mm. Meets the regs but does have some losses. We have just changed it to 4 mm for peace of mind. If they use 2.5 mm AC cable as standard it would probably still be more efficient with longer DC cables anyway without even increasing their size! in my house the route from the loft to the consumer unit is not simple and is quite long, 30 meters or so, several awkward spaces to get it though, so I'd expect it to be much simpler and cost effective to run is as a single fat AC rather than a bundle of dozens of DC. any views on batteries in loft? to me it seems daft (physical access, weight, temperature). We have 70metres minimum DC cable from panels in field to inverter in utility room. then 3m AC to consumer unit. 4kw system still producing average 3600kwh pa after 8 years. Alternative was to build a shed for inverter in the field! in my house the route from the loft to the consumer unit is not simple and is quite long, 30 meters or so, several awkward spaces to get it though, so I'd expect it to be much simpler and cost-effective to run is as a single fat AC rather than a bundle of dozens of DC. any views on batteries in the loft? to me, it seems daft (physical access, weight, temperature). The real question regarding batteries is - will you ever see a positive return on the investment. This may seem strange, but it is a hard calculation to work out and current prices make it hard to see a valid return. For even the cheapest Li based solutions (self-install solis+pylon) the cost per kWh stored over a 10-year system life, for a large system that is fully cycled once a day works out at around 10p per kWh in terms of basic ownership costs. This is before you take into account that the equipment is still falling in price, so you could save money by deferring the purchase and that the money you spend could be earning some form of interest if saved instead. With each pylon battery weighing 24kg you will have issues placing many of them in the loft space unless the weight can be distributed to a solid wall or across a large area. The standard 'finger in the air' figure for loft load bearing is just 40kg/m2, so just 2 stacked on top of each other (or side by side) will be an issue. I would love to see the installer's H&S report on the installation process and their structural engineer report regarding load bearing for a loft install. Your best bet is to split the PV installation from the battery installation, with the batteries and their inverter/charger being connected to the AC side of your mains and on solid ground. This will also allow you to consider the 2 systems independently of each other and maybe get the PV done while there is still some FiTs payments, while maybe deferring the battery solution. Hello , i would think that you need multible MPPT tracker for your 3 diffrent roofs and Shade ? This can turn into tail wagging dog but firstly check the DNO. You can put the the bits and pieces just where you want but in my case i put the inverter near the panels and the FITS meter next to it so as to reduce losses before the FITS reading. I do not like the idea of PV-inverter to AC -inverter to DC -storage batts - inverter to AC - to car batts and thats before whether it makes economic sense to have storage batts -which it does not. It is of course possible to have PV DC to storage batts but this would mis out the FITS meter! You do no say if you are a 2 car family because if you are the more practical and cost effective plan is to buy a 2nd EV. With that and a diverter for hot water there will be very little to charge a storage batt except in the height of summer. Speak to Gavin at www.Leeds-solar - very knowledgeable and out of the box thinking to all your PV/storage questions. Where there is a long cable run and voltage drop is an issue, I understood that it was preferable to use whichever of AC / DC had the higher voltage / lower current as the voltage drop is proportional to the current. When my PV was installed, my installer use 4mm SWA for the AC link from the inverter to the generation meter and consumer unit. His rational was that in the future it would be less likely for a future rogue sparky to spur onto a SWA cable than normal cable, yet alone a DC cable. Depending on whether you complete your install before FITs stop, there are advantages in having an AC link for measuring generation when batteries are involved. Not having batteries, I don't know the details enough to explain them, but I am sure that others will be able to advise. meaning get installer to do the application before deciding on sizing and signing contract? so the likes of http://www.windandsun.co.uk/media/748188/SolarEdge-StorEdge-System-Diagram.png do exactly that. It can only be metered after charging batt, in which case FITS and export meter are both after the usage. Doesn't make sense to me to use such a system in UK. we are a 2 car, but the 2nd is a diesel 4x4 that pulls a caravan. no realistic prospect to change it (nothing else can do the job). More realistic is changing the PHEV to a BEV now they are decreasing in price for usable real-world range. I'll ping them, assuming they are happy to travel down the M1 for work. although a guy from a company that came round this week was from wales, so it seems they do travel. can you give me any clues on supplier? as I mentioned, the PV inverter / controller / optimiser part is the bit where I am struggling the most to pick my way through the supplier / system choices. Without a DC generation meter (if they exist), the ability to charge the battery on a DC coupled system from a generator or the mains would make it FITs ineligible. The two hybrid inverters you meantioned seem both a bit too small for a 8 kW plus PV , especially on the charging side ( under 3000 watt ?) so not sure if the PV is oversized what will happen to the overproduction and full battery ? if the for example the solis can export max of 3000 watt ?